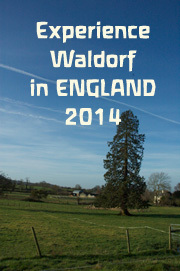 “Experience Waldorf in England 2016” is a programme for teens and adults who are interested in cultural experiences and “learning by doing” in a Waldorf environment. The two-week programme has two parts to it; morning sessions are for the Japanese teens and adults and afternoon craft sessions are open to the public. In the afternoon sessions we offer blacksmithing, green woodworking, coppersmithing, pottery, stained glass making, and veil painting. We have also added kinder lyre carving, and Waldorf doll making as optional evening classes. Afternoon sessions and kinder lyre carving are open to the public where Japanese students and adults will be joined by local residents and participants from other parts of England and Europe. This new programme surely will be a fruitful time for the participants to learn, mingle and experience different cultures. The Japanese students will be offered a home-stay supported by Wynstone’s community. This will be one of the most rewarding experiences where students will be submersed into English culture and life and it will also be a wonderful opportunity for the local residents to exchange and learn about different cultures. e-waldorf is still seeking host families for this programme. This programme is developed and administered by e-waldorf representative, Kayo Ishikawa-Voss (established in 2009 ) and run by experienced teachers with Waldorf school teacher qualifications. e-waldorf publishes home educational materials and offers on-line workshops in the Japanese language. This site is JAPANESE only. But you will see lots of photographs.